If music be the food of love, FIGHT ON Spotify. Wise old William Shakespeare once said, “If music be the food of love, play on”. And for Spotify? They are definitely heeding Mr. Shakespeare’s advice. This is not without competition though, as others like Set.fm, SourceAudio, and Xbox (wait, Xbox?) are also vying for the dollars in the music industry. 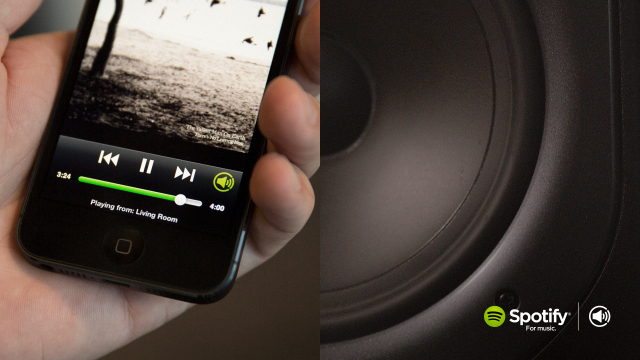 Since its launch, Spotify has been establishing several hardware deals. This happens through embedding Spotify’s technology into micro chips, which are then placed in various electronic devices like those from Bang & Olufsen, Philips, Pioneer and so on. Currently, two chipmakers are on this list: SMSC (now part of Microchip) and Frontier Silicon. And with the new Spotify Connect (seen as the green icon next to the forward button in picture above), Spotify is evidently planning to advance further into the home entertainment systems. This new addition to the Spotify app allows users to seamlessly transfer the playing of music onto another device that is connected to the same Wifi network. So imagine entering your house and being able to listen to the same music continuously on your home karaoke system at the press of this button. Pretty neat! To date, Spotify has raised $288 million in fundings. Now with 6 million paying users and over 10 million others who use the app for free, they are asking it big. In their next round of funding, they are looking for approximately $5.27 billion. That is a pretty hefty amount for a company who has constantly reported heavy losses, mostly stemming from the inability to attract paying users. However, with this added focus in the home entertainment systems, apart from its usual freemium business model, this request for the billions could very well be answered. For years, one major problem associated with the music industry had been the inability to bring consumers and producers of music together with both their best interests in mind. Consumers are always searching for ways to get music cheaply (or illegally free) while music producers are always searching for ways to protect their music, either through trademarks or aggressively suing for copyright infringements. When Youtube came, the consumer problem was almost solved, but familiar messages on the videos prior to playing them such as “The video has been removed due to copyright infringements” clearly shows how the producer problem remains unsolved. However, with Spotify’s entry into the music industry, consumers and producers seemed pretty happy. Consumers either listened to music for free with advertisements being profusely inserted after every song, or paid a pretty low monthly subscription fee. Producers got paid their royalties for every song played or downloaded. Every one is happy now, and extra happy because Spotify brought an added benefit of discovering music on the go. And with a large player like Xbox trying to squeeze Spotify out of this game, Spotify quickly moves over to the home entertainment systems to offer other innovative solutions. Word of caution though, Spotify: rumor has it that Mr. Google wants in on this same pie.